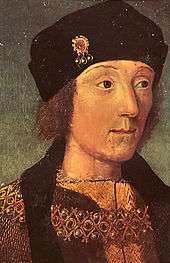 Henry VII (Welsh: Harri Tudur; 28 January 1457 – 21 April 1509) was King of England after seizing the crown on 22 August 1485 until his death, the first monarch of the House of Tudor. He ruled the Principality of Wales until 29 November 1489 and was Lord of Ireland. Henry can also be credited with a number of commendable administrative, economic and diplomatic initiatives, though the latter part of his reign was characterised by financial greed stretching the bounds of legality. Perhaps most impactful to posterity was his establishment of the Pound Avoirdupois as a weights and measures standard—with several adjustments this became part of the Imperial System and today's International pound units. His supportive stance of the islands' wool industry and stand-off with the Low Countries had long lasting benefits to all the British Isles economy. However, the capriciousness and lack of due process that indebted many would tarnish his legacy and fortunately, were soon ended upon Henry VII's death, after a commission revealed widespread abuses. According to the contemporary historian Polydore Vergil, simple "greed" underscored the means by which royal control was over-asserted in Henry's final years. Henry's paternal grandfather, Owen Tudor, originally from the Tudors of Penmynydd, Isle of Anglesey in Wales, had been a page in the court of Henry V. He rose to become one of the "Squires to the Body to the King" after military service at Agincourt. Owen is said to have secretly married the widow of Henry V, Catherine of Valois. One of their sons was Edmund Tudor, father of Henry VII. 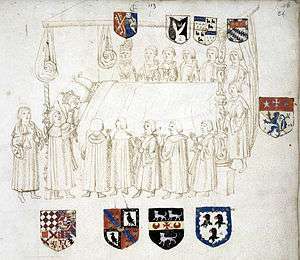 Edmund was created Earl of Richmond in 1452, and "formally declared legitimate by Parliament". In reality, however, his hereditary connections to Welsh aristocracy were not strong. He was descended by the paternal line, through several generations, from Ednyfed Fychan, the seneschal (steward) of Gwynedd and through this seneschal's wife from Rhys ap Tewdwr, the King of Deheubarth in South Wales. His more immediate ancestor, Tudur ap Goronwy, had aristocratic land rights, but his sons, who were first cousins to Owain Glyndŵr, sided with Owain in his revolt. One son was executed and the family land was forfeited. Another son, Henry's great-grandfather, became a butler to the Bishop of Bangor. 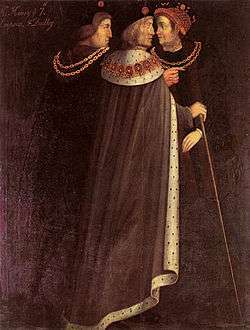 Owen Tudor, the son of the butler, like the children of other rebels, was provided for by Henry V, a circumstance that precipitated his access to Queen Catherine of Valois. Notwithstanding this lineage, to the bards of Wales, Henry was a candidate for Y Mab Darogan – "The Son of Prophecy" who would free the Welsh from oppression. Henry lived in the Herbert household until 1469, when Richard Neville, Earl of Warwick (the "Kingmaker"), went over to the Lancastrians. Herbert was captured fighting for the Yorkists and executed by Warwick. When Warwick restored Henry VI in 1470, Jasper Tudor returned from exile and brought Henry to court. When the Yorkist Edward IV regained the throne in 1471, Henry fled with other Lancastrians to Brittany, where he spent most of the next 14 years under the protection of Francis II, Duke of Brittany. In November 1476, Henry's protector fell ill and his principal advisers were more amenable to negotiating with the English king. Henry was handed over and escorted to the Breton port of Saint-Malo. While there, he feigned stomach cramps and in the confusion fled into a monastery. As at Tewkesbury Abbey after 1471 battle, Edward IV prepared to order his extraction and probable execution. The townspeople took exception to his behaviour, however, and Francis recovered from his illness. Thus a small band of scouts rescued Henry. By 1483, Henry's mother was actively promoting him as an alternative to Richard III, despite her being married to a Yorkist, Lord Stanley. At Rennes Cathedral on Christmas Day 1483, Henry pledged to marry the eldest daughter of Edward IV, Elizabeth of York, who was also Edward's heir since the presumed death of her brothers, the Princes in the Tower (King Edward V and his brother Richard of Shrewsbury, Duke of York). Henry then received the homage of his supporters. With money and supplies borrowed from his host, Francis II, Duke of Brittany, Henry tried to land in England, but his conspiracy unravelled, resulting in the execution of his primary co-conspirator, the Duke of Buckingham. Now supported by Francis II's prime-minister, Pierre Landais, Richard III attempted to extradite Henry from Brittany, but Henry escaped to France. He was welcomed by the French, who readily supplied him with troops and equipment for a second invasion. Henry gained the support of the Woodvilles, in-laws of the late Edward IV, and sailed with a small French and Scottish force, landing in Mill Bay, Pembrokeshire, close to his birthplace. He marched towards England accompanied by his uncle Jasper and the Earl of Oxford. Wales was traditionally a Lancastrian stronghold, and Henry owed the support he gathered to his Welsh birth and ancestry, being directly descended, through his father, from Rhys ap Gruffydd. He amassed an army of around 5,000 soldiers. The first concern for Henry was to secure his hold on the throne. He declared himself king "by right of conquest" retroactively from 21 August 1485, the day before Bosworth Field. Thus anyone who had fought for Richard against him would be guilty of treason, and Henry could legally confiscate his lands and property of Richard III while restoring his own. However, he spared Richard's nephew and designated heir, the Earl of Lincoln, and he made Margaret Plantagenet, a Yorkist heiress, Countess of Salisbury sui juris. He took great care not to address the baronage, or summon Parliament, until after his coronation, which took place in Westminster Abbey on 30 October 1485. Almost immediately afterwards, he issued an edict that any gentleman who swore fealty to him would, notwithstanding any previous attainder, be secure in his property and person. For most of Henry VII's reign Edward Story was Bishop of Chichester. Story's register still exists and according to the 19th century historian W.R.W Stephens "affords some illustrations of the avaricious and parsimonious character of the king". It seems that the king was skillful at extracting money from his subjects on many pretexts including that of war with France or war with Scotland. The money so extracted added to the king's personal fortune rather than the stated purpose. 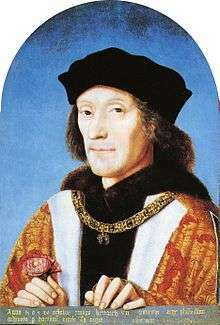 Unlike his predecessors, Henry VII came to the throne without personal experience in estate management or financial administration. Yet during his reign he became a fiscally prudent monarch who restored the fortunes of an effectively bankrupt exchequer. Henry VII introduced stability to the financial administration of England by keeping the same financial advisors throughout his reign. For instance, other than the first few months of the reign, Lord Dynham and Thomas Howard, earl of Surrey were the only two office holders in the position of Lord High Treasurer of England throughout his reign. Henry VII improved tax collection within the realm by introducing ruthlessly efficient mechanisms of taxation. He was supported in this effort by his chancellor, Archbishop John Morton, whose "Morton's Fork" was a catch-22 method of ensuring that nobles paid increased taxes. Morton's Fork may actually have been invented by another of Henry's supporters, Richard Foxe. However, whether it is called "Morton's Fork" or "Fox's Fork", the result was the same: Those nobles who spent little must have saved much and, thus, they could afford the increased taxes; on the other hand, those nobles who spent much obviously had the means to pay the increased taxes. 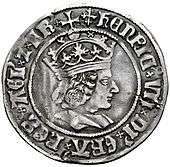 Royal government was also reformed with the introduction of the King's Council that kept the nobility in check. Henry VII's policy was both to maintain peace and to create economic prosperity. Up to a point, he succeeded. He was not a military man and had no interest in trying to regain French territories lost during the reigns of his predecessors; he was therefore ready to conclude a treaty with France at Etaples that brought money into the coffers of England, and ensured the French would not support pretenders to the English throne, such as Perkin Warbeck. However, this treaty came at a slight price, as Henry mounted a minor invasion of Brittany in November 1492. Henry decided to keep Brittany out of French hands, signed an alliance with Spain to that end, and sent 7,000 troops to France. The confused, fractious nature of Breton politics undermined his efforts, which finally failed after three sizeable expeditions, at a cost of £24,000. However, as France was becoming more concerned with the Italian Wars, the French were happy to agree to the Treaty of Etaples. By the time of his death, he had amassed a personal fortune of £1.25 million. Henry's most successful diplomatic achievement as regards the economy was the Magnus Intercursus ("great agreement") of 1496. In 1494, Henry embargoed trade (mainly in wool) with the Netherlands as retaliation for Margaret of Burgundy's support of Perkin Warbeck. The Merchant Adventurers, the company which enjoyed the monopoly of the Flemish wool trade, relocated from Antwerp to Calais. At the same time, Flemish merchants were ejected from England. The stand-off eventually paid off for Henry. Both parties realised they were mutually disadvantaged by the reduction in commerce. Its restoration by the Magnus Intercursus was very much to England's benefit in removing taxation for English merchants and significantly increasing England's wealth. In turn, Antwerp became an extremely important trade entrepot, through which, for example, goods from the Baltic, spices from the east and Italian silks were exchanged for English cloth. In 1502, Henry VII's first son and heir-apparent, Arthur, Prince of Wales, died suddenly at Ludlow Castle, very likely from a viral respiratory illness known, at the time, as the "English sweating sickness". This made Henry, Duke of York (Henry VIII) heir-apparent to the throne. The King, normally a reserved man who rarely showed much emotion in public unless angry, surprised his courtiers by his intense grief and sobbing at his son's death, while his concern for the Queen is evidence that the marriage was a happy one, as is his reaction to the Queen's death the following year, when he shut himself away for several days, refusing to speak to anyone. Henry made half-hearted plans to remarry and beget more heirs, but these never came to anything. In 1505 he was sufficiently interested in a potential marriage to Joan, the recently widowed Queen of Naples, that he sent ambassadors to Naples to report on the 27-year-old's physical suitability. The wedding never took place, and curiously the physical description Henry sent with his ambassadors describing what he desired in a new wife matched the description of Elizabeth. After 1503, records show the Tower of London was never again used as a royal residence by Henry Tudor, and all royal births under Henry VIII took place in palaces. Henry VII was shattered by the loss of Elizabeth, and her death broke his heart. During his lifetime he was often jeered by the nobility for his re-centralizing of power in London, and later the 16th-century historian Francis Bacon was ruthlessly critical of the methods by which he enforced tax law, but equally true is the fact that Henry Tudor was hellbent on keeping detailed bookkeeping records of his personal finances, down to the last halfpenny; these and one account book detailing the expenses of his queen survive in the British National Archives. Until the death of his wife Elizabeth, the evidence is clear from these accounting books that Henry Tudor was a more doting father and husband than was widely known. Many of the entries in his account books show a man who loosened his purse strings generously for his wife and children, and not just on necessities: in spring 1491 he spent a great amount of gold on his daughter Mary for a lute; the following year he spent money on a lion for Queen Elizabeth's menagerie. With the death of Elizabeth, the possibility for such family indulgences greatly diminished. Immediately after Elizabeth's death, Henry became very sick and nearly died himself, and only allowed Margaret Beaufort, his mother, near him: "privily departed to a solitary place, and would that no man should resort unto him." Henry is the first English king for whose appearance we have good contemporary visual records in realistic portraits that are relatively free of idealization. At twenty-seven, Henry was tall, slender, with small blue eyes, which were said to have a noticeable animation of expression, and noticeably bad teeth in a long, sallow face beneath very fair hair. Amiable and high-spirited, Henry Tudor was friendly if dignified in manner, while it was clear to everyone that he was extremely intelligent. His biographer, Professor Chrimes, credits him – even before he had become king – with possessing "a high degree of personal magnetism, ability to inspire confidence, and a growing reputation for shrewd decisiveness". On the debit side, he may have looked a little delicate as he suffered from poor health. Historians have always compared Henry VII with his continental contemporaries, especially Louis XI of France and Ferdinand II of Aragon. By 1600 historians emphasised Henry's wisdom in drawing lessons in statecraft from other monarchs. By 1900 the "New Monarchy" interpretation stressed the common factors that in each country led to the revival of monarchical power. This approach raised puzzling questions about similarities and differences in the development of national states. In the late 20th century a model of European state formation was prominent in which Henry less resembles Louis and Ferdinand. Upon his succession as king, Henry became entitled to bear the arms of his kingdom. 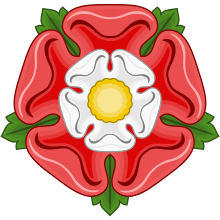 After his marriage, he used the red-and-white rose as his emblem – this continued to be his dynasty's emblem, known as the Tudor rose. Henry and Elizabeth's children are listed below. 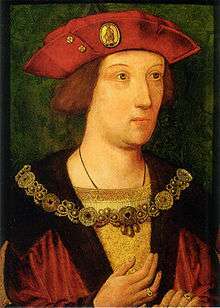 Arthur Tudor, Prince of Wales, first husband of Catherine of Aragon. Margaret Tudor, wife of King James IV of Scotland and great grandmother of James I of England. Henry VIII of England, Henry VII's successor. Mary Tudor, Queen of France and subsequently wife of Charles Brandon. Arthur Tudor, Prince of Wales 19 September 1486 2 April 1502 Married Catherine of Aragon in 1501. Margaret Tudor 28 November 1489 18 October 1541 Married (1) James IV, King of Scotland (1473–1513) in 1503. Married (2) Archibald Douglas, 6th Earl of Angus (1489–1557) in 1514. Grandmother of both Mary, Queen of Scots and Henry Stuart, Lord Darnley, the parents of James I.
Henry VIII, King of England 28 June 1491 28 January 1547 Married (1) Catherine of Aragon (1485–1536) in 1509; had issue. Married (2) Anne Boleyn (1501–1536) in 1533; had issue. Married (3) Jane Seymour (1503–1537) in 1536; had issue. Married (4) Anne of Cleves (1515–1557) in 1540. Married (5) Catherine Howard (1520–1542) in 1540. Married (6) Catherine Parr (1512–1548) in 1543. Edward Tudor 1498? 1499 Died young. Katherine Tudor 2 February 1503 10 February 1503 Died shortly after birth. Mother, Elizabeth of York, died as a result of Katherine's birth. Sir Roland de Velville or Veleville 1474 25 June 1535 He was knighted in 1497 and was Constable of Beaumaris Castle. He is sometimes presented as the clear "illegitimate issue" of Henry VII of England by "a Breton lady whose name is not known". There is also, however, the possibility that he was simply a favored member of the court of Henry VII and later recipient of beneficences, brought home to England with 28-year-old Henry after his exile in Brittany. Henry VII's elder surviving daughter Margaret was married first to James IV of Scotland (reigned 1488–1513). Their son became James V of Scotland (reigned 1513–42), whose daughter became Mary, Queen of Scots (reigned 1542–67). Margaret Tudor's second marriage was to Archibald Douglas; their grandson, Henry Stuart, Lord Darnley married Mary, Queen of Scots. Their son, James VI of Scotland (reigned 1567–1625), inherited the throne of England as James I (reigned 1603–25) after the death of Henry's granddaughter, Elizabeth I (reigned 1558–1603). After divorcing Douglas, her third and final marriage was to Henry Stewart, with whom she had another daughter, Dorothea Stewart. Henry VII's other surviving daughter, Mary first married King Louis XII of France (reigned 1498–1515), who died after only about three months of marriage. She then married the Duke of Suffolk without the permission of her brother, now King Henry VIII. Their daughter Frances married Henry Grey, and her children included Lady Jane Grey, in whose name her parents and in-laws tried to seize the throne after Edward VI of England (reigned 1547–53) died. The current monarch of the United Kingdom, Elizabeth II, is a direct descendant of Henry VII. The daughter of Henry's double-great-great grandson James I/VI, Elizabeth Stuart, was the mother of Sophia of Hanover whose descendants were the monarchs of the House of Hanover and the succeeding House of Saxe-Coburg-Gotha/Windsor. ↑ "Henry Tudor, a Proud Welshman". Nathen Amin. 1 2 "pound avoirdupois". Sizes, Inc. 17 April 2012. Retrieved 13 September 2016. 1497-1558 - Henry VII authorizes standard. & A unit of mass = 453.592 37 grams (now, technically, the international pound), now used chiefly in the United States, but since the 16th century the most commonly encountered unit of mass throughout the English-speaking world. The magnitude of the pound avoirdupois has varied less than 1% since the middle of the 14th century. ↑ Guy, John (1988). "The Tudor Age (1485–1603)". The Oxford History of Britain: 272–273. ↑ Kendall, Paul Murray. Richard the Third. p. 13. ↑ Williams, Neville. The Life and Times of Henry VII. p. 17. ↑ Kendall, Paul Murray. Richard the Third. p. 156. 1 2 Chrimes, S.B. Henry VII. p. 3. ↑ Davies, Norman. The Isles – A History. pp. 337–379. 1 2 Mackie, J.D. The Earlier Tudors 1485–1558. p. 47. 1 2 Mackie, J.D. The Earlier Tudors 1485–1558. p. 54. ↑ Chrimes, S.B. Henry VII. p. 4. ↑ Ashley, Mike. The Mammoth Book of British Kings and Queens. p. 331. ↑ Garmon Jones, W. Welsh Nationalism and Henry Tudor. p. 30. ↑ Chrimes, S.B. Henry VII. pp. 4–5. ↑ Starkey, David. Monarchy: From the Middle Ages to Modernity. p. 4. ↑ Marilee Mongello. "Tudor Monarchs – Henry VII, one". Englishhistory.net. Retrieved 7 February 2013. 1 2 Williams, Neville. The Life and Times of Henry VII. p. 19. ↑ S. B. Chrimes, Henry VII (New Haven, Connecticut: Yale University Press, 1977) p. 65. 1 2 Williams, Neville. The Life and Times of Henry VII. p. 25. ↑ Kendall, Paul Murray. Richard the Third. p. 297. ↑ Henry's return to Wales was regarded by some as the fulfilment of a Messianic prophecy. Rees, David (1985). The Son of Prophecy: Henry Tudor's Road to Bosworth. London: Black Raven Press. ISBN 0-85159-005-5. ↑ Kendall, Paul Murray. Richard the Third. p. 361. ↑ Estimates of the size of Henry's army at Bosworth vary. Williams, Neville. The Life and Times of Henry VII. p. 31. , gives a figure of 'perhaps' 6,000. ↑ S.. Chrimes, Henry VII, p. 50. ↑ "Westminster Abbey website: Coronations, Henry VII and Elizabeth of York". Retrieved 4 March 2013. ↑ S. B. Chrimes, Henry VII, p. 53. ↑ Genealogical tables in Morgan, Kenneth O. The Oxford History of Britain. p. 709. ↑ S. B. Chrimes, Henry VII, p. 51. ↑ S. B. Chrimes, Henry VII, p. 69. ↑ S. B. Chrimes, Henry VII, p. 72. ↑ Williams, Neville. The Life and Times of Henry VII. p. 62. ↑ S. B. Chrimes, Henry VII, pp. 69–70. ↑ S. B. Chrimes, p. 72. ↑ Penn 2011, pp. 22–23. ↑ S. B. Chimes, Henry VII (Yale University Press, 1977) p. 119. 1 2 S. B. Chrimes, Henry VII, p. 203. ↑ Weir, Alison. Henry VIII: King and Court. p. 13. ↑ Penn 2011, p. 203-204. ↑ Williams, Neville. The Life and Times of Henry VII. pp. 167–168. ↑ Williams, Neville. The Life and Times of Henry VII. pp. 198–201. ↑ Williams, Neville. The Life and Times of Henry VII. p. 178. ↑ MacCulloch, Diarmaid (1996). "The Consolidation of England 1485–1603". The Oxford Illustrated History of Tudor and Stuart Britain: 39–42. ↑ Penn 2011, p. 70. ↑ Penn, Thomas (March 12, 2013). Winter King: Henry VII and the Dawn of Tudor England (Reprint ed.). Simon and Schuster. p. 204. ISBN 978-1439191576. ↑ Schwarz, Arthur L., VIVAT REX! An Exhibition Commemorating the 500th Anniversary of the Accession of Henry VIII (The Grolier Club, 2009), p. 58 "Henry's Father Searches for a New Wife". ↑ Amy Licence. "his story, her story". authorherstorianparent.blogspot.com. ↑ "A Short History of Early Modern England". google.com. ↑ "Domestic and foreign policy of Henry VII". ↑ "Henry VII Winter King". Queen to History. ↑ Penn, Thomas (March 12, 2013). Winter King: Henry VII and the Dawn of Tudor England (Reprint ed.). Simon and Schuster. pp. 110–113. ISBN 978-1439191576. Ashley, Mike (2002). British Kings & Queens. Carroll & Graf. pp. 280–286. ISBN 0-7867-1104-3. Chrimes, Stanley B. (1999) [First publisher in 1972]. Henry VII. New Haven: Yale University Press, second ed. ISBN 0-520-02266-1. Cunningham, Sean (2007). Henry VII. New York: Routledge. ISBN 0-415-26620-3. Guy, John (1988). "The Tudor Age (1485–1603)". In Morgan, Kenneth O. The Oxford History of Britain. Oxford: Oxford University Press. ISBN 0-19-285202-7. MacCulloch, Diarmaid (1996). "The Consolidation of England 1485–1603". In Morrill, John. The Oxford Illustrated History of Tudor and Stuart Britain. Oxford: Oxford University Press. ISBN 0-19-289327-0. Morgan, Kenneth O. (1988). The Oxford History of Britain. Oxford: Oxford University Press. ISBN 0-19-285202-7. Rogers, Caroline; Turvey, Roger (2000). Henry VII. London: Hodder & Stoughton Educational. ISBN 0-340-75381-1. Starkey, David (2006). Monarchy: From the Middle Ages to Modernity. New York: Harper Perennial. ISBN 0-00-724766-4. Towle, Carolyn; Hunt, Jocelyn (1998). Henry VII. New York: Longman. ISBN 0-582-29691-9. Weir, Alison (2011). Britain's Royal Families: The Complete Genealogy. London: Vintage. ISBN 1-446-44911-4. Weir, Alison (2002). Henry VIII: King and Court. London: Pimlico. ISBN 0-7126-6451-3. Weir, Alison (1995). The Princes in the Tower. New York: Ballantine. ISBN 0-345-39178-0.